One week after CES and I thought we will be quiet for a while - wrong! This week Westone officially announced the latest addition (and best yet) to their custom IEM offering with the new ES3X. For a company that took almost two years to finalize their top universal IEM (Westone 3 that is), Westone certainly surprised people with this custom IEM as it only takes them a few short months from pre-production to final production. No doubt that they have included the knowledge and experience they learned from developing Westone 3 into the new custom. 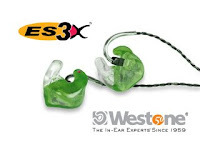 Westone ES3X, the best Westone custom IEM to date. It has three transducers on each side splitting in three ways. Save up some money before you even look into the detail of it cause the one thing we can be certain is, it won't be cheap. 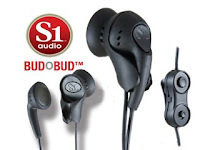 S1 Audio's BUDBUD, one really weird earbud concept that I missed last week during CES. In short, it is two earbuds built into one cable with selectable switch to activate one or both sets (for sharing, as told). Why do any one want to design such an earbud? I guess the answer is, becasue we can. No price yet.